Select the track you want to edit and use the Views > Piano Roll View command or press ALT+3. Double-click a MIDI clip in the Clips pane (you can change this option with the Track view Options > Click Behavior > Double-Click > MIDI Clips command). Figure 643. The Piano Roll view. The Piano Roll view displays all MIDI notes and events from one or more tracks in either the Drum Grid pane or the Notes pane. The Notes pane is a grid format that looks much like a player piano roll. The Drum Grid pane is also laid out in a grid, but the sound of these drum notes are determined by the settings in the Drum Map pane. In both the Drum Grid pane and the Notes pane, notes are displayed as horizontal bars. In the Notes pane, pitch runs from bottom to top, with the left vertical margin indicating the pitches as piano keys or note names. Time is displayed running left to right with vertical measure and beat boundaries. In the Drum Grid pane, the drum sounds are mapped according to the current drum map in the Note Map pane. Like the Notes pane, time is displayed running left to right with vertical measure and beat boundaries. The Piano Roll view makes it easy to add, edit, and delete MIDI events from a track. 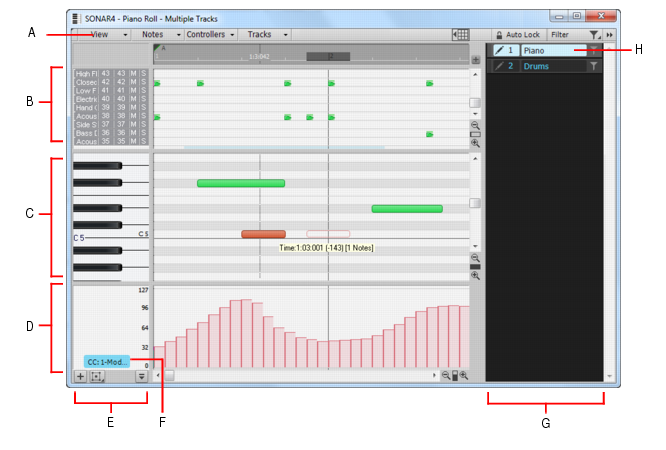 The Piano Roll view consists of the Notes pane, Note Map pane, Drum Grid pane, the Controller pane, and the Track pane. Note: [Professional and Platinum only] When you initially open the Piano Roll view, you can choose to show all tracks, or only the tracks that are selected at the time you open the Piano Roll view. To do so, click the Piano Roll view View menu and select Filter to Selection On Open.